Operation Allied Force was a NATO contingency response aimed at ensuring full compliance with UN Security Council Resolution 1199, adopted on 23 September 1998. UNSCR 1199 was in response to the Kosovo crisis, which had began in early 1998 when large-scale fighting broke out, resulting in the displacement of some 300,000 people. The crisis had subsequently to a ceasefire agreement in October 1998, which subsequently broke down, followed by peace talks in Paris in the spring of 1999, which also subsequently broke down. Authorities in the Federal Republic of Yugoslavia apparently thought that they could wipe out the Kosovar Liberation Army in 5-7 days as part of Operation Horseshoe. They thought thought once they did that, they could negotiate an arrangement for peace. The Serbian leadership apparently also assumed that NATO would never launch airstrikes, and that once the airstrikes were launched they would be pinpricks lasting a few days. Furthermore, they assumed that NATO would not remain unified long enough to carry out significant air attacks, which would quickly end due to political divisions within NATO. The Federal Republic of Yugoslavia also launched a major propaganda campaign against the subsequent strikes. Provide credible assurance of Serbian willingness to work on the basis of the Rambouillet Accords in the establishment of a political framework agreement for Kosovo in conformity with international law and the Charter of the United Nations. NATO was prepared to suspend its air strikes once Belgrade unequivocally accepted the above mentioned conditions and demonstrably began to withdraw its forces from Kosovo according to a precise and rapid timetable. This would follow the passage of a United Nations Security Council resolution requiring the withdrawal of Serb forces and the demilitarization of Kosovo and encompassing the deployment of an international military force to safeguard the swift return of all refugees and displaced persons, as well as the establishment of an international provisional administration of Kosovo. To execute Operation Allied Force, a multinational force was tasked by NATO to bring a swift end to hostilities committed by the Federal Republic of Yugoslavia against ethnic Albanians in the southern province of Kosovo. The military objective of Operation Allied Force was to degrade and damage the military and security structure that Yugoslav President President Milosevic had used to depopulate and destroy the Albanian majority in Kosovo. The Supreme Allied Commander Europe (SACEUR) delegated authority for the implementation of Operation Allied Force to the Commander in Chief of Allied Forces Southern Europe (CINCSOUTH), whose headquarters was in Naples, Italy. CINCSOUTH delegated control of the operation to the Commander, Allied Air Forces Southern Europe (COMAIRSOUTH), also based in Naples. Operational conduct of day-to-day missions was delegated to the Commander 5th Allied Tactical Air Force, at Vicenza, Italy. 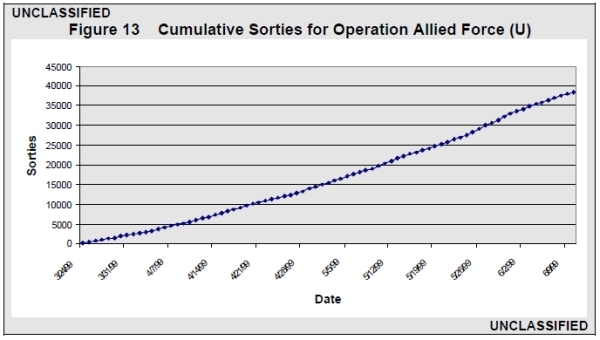 The US contribution to Operation Allied Force came from forces already deployed in support of Operation Noble Anvil. These forces had previously provided support to NATO's Operation Determined Force. At the beginning of Operation Allied Forces, about 7,300 US Air Force, Navy and Marine Corps service members were assigned to the United States European Command in support of Operation Noble Anvil. Following the October 1998 ceasefire agreement, NATO had begun Operation Determined Force, which positioned forces and otherwise prepared for the potential use of force should subsequent negotiations fail. In addition, a plan for this potential offensive action was developed. On 24 September 1998, NATO Defense Ministers, meeting at Villamoura, Portugal, approved issuance of Activation Warnings for 2 different types of air operations. The first, a 5-phased air operation, envisioned an air attack beginning with deployment of air assets and the suppression of enemy air defenses and moving through phases to ultimately eliminate major elements of Yugoslavian military and security force capability. The second option was known as the "Limited Air Response" and was designed to be a short notice, limited air response to a serious, but limited incident in Kosovo, with the aim of preventing a further deterioration of the situation. Operation Plan (OPLAN) 10601, "Allied Force," covered the phased plan, which went from the transfer over a possible application outside of and within the air space of the Federal Republic of Yugoslavia up to redeployment. The NATO Activation Order (ACTORD) was effective from 13 October 1998, with simultaneous approval and preparatory exercises. The decision by NATO on 27 October 1998 was to maintain the ACTORD with execution dependent on further a NATO council decision. Constrained by the directive that collateral damage was to be avoided as far as possible, the concept of operations for any offensive action envisioned targeting based on a phasewise gradual, situation-adjusted application of NATO air forces, depending upon political and military developments. Operation Allied Force implemented, when ordered by the North Atlantic Council, phased operations which differ according to the attack targets and their geographical location. 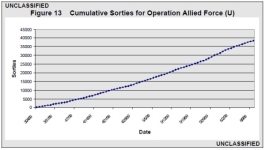 Operation Allied Force's Phase Zero, released on 20 January 1999 as political signal, saw air forces of NATO shifted for the accommodation of practice flight operation to their operational airfields. Phase 1 was the conduct of limited air operations, such as air strikes against designated militarily significant targets, which began on 24 March 1999 with attacks on the integrated air-defense system (e.g. weapon systems, radar facilities, control devices, airfield/aircraft) in the entire Federal Republic of Yugoslavia. Phase 1 evolved from the separate limited response proposed on in September 1998. Phase 1 was followed by Phase 2, which was authorized on 27 March 1999, and saw attacks extended to the security forces infrastructure military in Kosovo and reinforcement forces (e.g. headquarters, telecommunication installations, material and ammunition depot, systems for production and storage of fuel, barracks). The authorization of this phase took place with the unanimous resolution of the NATO allies. The Phase 1 "Limited Air Response" provided a fast available, temporally limited and supported with small strength feasible air operations against military targets in the Federal Republic of Yugoslavia - exclusive to the use of precision standoff weapons. Additional operations outside of the Federal Republic of Yugoslavia were provided for observation and for the air defense of the air space of NATO nations and Bosnia-Herzegovina, as well as to the protection of NATO's Stabilization Force (SFOR) in Bosnia-Herzegovina. The selection of target categories with the target of the minimization of collateral damage with at the same time high political and military significance. Operation execution was required within 48 hours after decision of the NATO advice possible. This Operations Concept had been approved on 21 August 1998, and had been reaffirmed by the subsequent NATO ACTORD on 13 October 1998 and the subsequent decisions regarding that ACTORD. The early goal of Phase 1 of the campaign was to attempt to force Yugoslavia to the bargaining table. Some countries in NATO argued that it might be possible to do that with a few days or a week of attacks, without demolishing the whole country. Some of the NATO partners were initially prepared to wage only a phased air operation to show NATO's resolve in the hope of achieving an early settlement. The campaign did not begin the way that America normally would apply air power, however, which would have involved massively striking at strategic centers of gravity that supported President Milosevic and his oppressive regime. 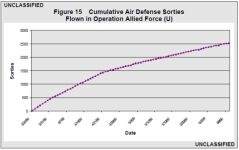 The phased concept of operations of Operation Allied Force did not apply principles of military operations such as surprise and the use of overwhelming force, and this cost time, effort and potentially additional casualties, the net result being that the campaign was undoubtedly prolonged. NATO did not succeed in this initial attempt to coerce Milosevic through airstrikes to accept its demands, nor did it succeed in preventing the Federal Republic of Yugoslavia from pursuing a campaign of ethnic separation. Initial air operations started at an altitude that was estimated to be appropriate for the air defense threat that was expected, which allowed attacks against fixed targets with guided munitions in Kosovo and around the capital, Belgrade. Flying at or above 15,000 feet, attack aircraft were flying only at night and were instructed not to make multiple passes or other maneuvers that would entail unnecessary risks. 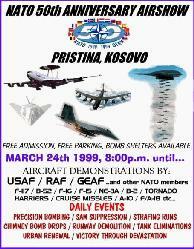 NATO gained air superiority over Kosovo and the rest of Yugoslavia by degrading Milosevic's integrated air defense system. After allied planes mistakenly bombed 2 refugee convoys on the same day near the Kosovo town of Djakovica, new tactics were implemented with pilots flying lower to identify targets better. The net result was increased risk to allied pilots. Three NATO fighter-bombers were hit by ground fire in early May 1999, and an American F-16 crashed with engine failure over Serbia as a result of Yugoslav anti-aircraft fire. Also a major factor in Operation Allied Force was the weather. At the beginning of the operation, the weather was so poor that NATO could operate against fielded forces only about 15 percent of the time. During the first 2 months of air operations the majority of days the weather was unfavorable or marginal. Persistent low cloud cover over Kosovo and the rest of Yugoslavia forced the cancellation of many planned strikes. NATO had the capability to operate through solid cloud cover, but for a variety of reasons there were restrictions on operations in bad weather. The single biggest reason was the commitment to ensuring strikes against only military and military-related targets. Flying below the clouds was more dangerous from a technical standpoint, putting NATO air crews down into the range of tactical surface to air missiles, anti-aircraft artillery, and small arms fire. It also highlighted aircraft against the clouds, making them easier to see and target from the ground. Kosovo was a very mountainous area, and with the peaks of mountains frequently enveloped by the clouds, air crews were careful about avoiding terrain. The weather also provided some cover for the Serbian military to continue their attacks, and they took advantage of these times to conduct ground and air operations. In the end, Operation Allied Force's Phase 3 was not authorized. The focus of this phase was to be the expansion of the air operations against a broad range of particularly important targets of military importance north of the 44th parallel in the entire Federal Republic of Yugoslavia . By April 1999, it became apparent to NATO that a constrained, phased approach was not effective. At the insistence of US leaders, NATO widened the air campaign to produce the strategic effects in Serbia proper. At the April 1999 NATO Summit, SACEUR was given the flexibility to strike at additional targets, within the existing authority of Phase 1 and Phase 2 of the operation that were necessary to keep the pressure up, both on the tactical side in Kosovo and on the strategic side elsewhere in Yugoslavia. It is believed that Phase 4 and 5, which were also not authorized as a result of the shift away from the phased approach, involved the support of follow-on stabilization operations and redeployment operations respectively. This decision to shift approach came as Yugoslavia demonstrated that it was completely unmoved and intransigent. The shift in approach led to an increase in pressure and a growing tempo of attacks as a result of the decision at the NATO Summit here on 23 April 1999 to expand the Allied Force campaign. As the campaign continued, the target list expanded into so-called sustainment targets: petroleum, lines of communication, electrical grids, and command and control targets. During the course of the campaign, NATO developed mechanisms for delegating target approval authority to military commanders. For selected categories of targets — for example, targets in downtown Belgrade, in Montenegro, or targets likely to involve high collateral damage — NATO reserved approval for higher political authorities. NATO leaders used this mechanism to ensure that member nations were fully cognizant of particularly sensitive military operations, and, thereby, to help sustain the unity of the alliance. Legal reviews of selected targets were conducted at successive echelons of the chain of command. Targets nominated for approval by SACEUR received legal reviews in the field. Targets nominated that met the criteria requiring US National Command Authority (NCA) approval received detailed legal scrutiny by the Legal Counsel to the Chairman of the Joint Chiefs of Staff and by the Department of Defense General Counsel. Legal reviews involved evaluation of certain targets as valid military targets as governed by applicable principles of the laws and customs of armed conflict. Air operations did not attack some strategic targets because of anxiety among NATO's 19 governments that further accidental civilian casualties could erode public support for the operation. On 7 May 1999, NATO bombed the Chinese Embassy in Belgrade. The planned target was the Federal Directorate for Supply and Procurement in Belgrade, but the wrong building was attacked. Following NATO's mistaken bombing of the Chinese embassy, the alliance stopped hitting targets in the city for nearly 2 weeks while NATO authorities sought to ensure that another such mistake would not occur. 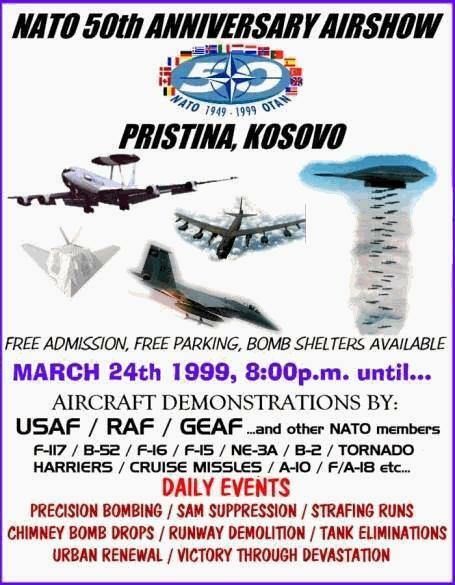 By mid-May 1999, NATO pilots had grown increasingly familiar with Kosovo's terrain and with the tactics of the Serbian Armed Forces on the ground. Pilots increasingly knew where Serbian forces were concentrated, and were more adept at striking "Flex" targets. Responsive or "Flex" targets were targets in the fielded forces, and normally not targets that would be a static target like a bridge or a petroleum area or a building. Such targets moved around, and would be located by various means, such as a pilot report or by Joint Surveillance Target Acquisition Radar System (JSTARS). NATO made sure to have aircraft that could respond rapidly to attack such "Flex" targets. Quick response options for targets that might pop up via different means included aircraft holding on a tanker outside a designated area waiting for a target to appear, aircraft on the ground waiting on alert, or aircraft diverted from another engagement zone to a target of opportunity. NATO also adapted its tactics to take maximum advantage of its comprehensive array of intelligence gathering capabilities to deal with unfavorable weather. By early May 1999, NATO was able to collect and distribute information efficiently so that air crews were able to react quickly to targets of opportunity. NATO also adjusted flying patterns to ensure a continuous presence of combat air power that was able to operate in the directed attacks against Serbian ground forces. NATO had planes circling, awaiting the call to strike from other aircraft flying forward air control spotter missions. All of this helped explain the change in the tactics of Serbian forces. They were operating in smaller and smaller units to make them harder to detect from the air. The downside for the Serbian forces was that this made them increasingly vulnerable to Kosovar Liberation Army ambushes, and it also made Serb forces less mobile to the benefit of those Kosovars still living within Kosovo. The fundamental factor in the conclusion of Operation Allied Force in June 1999, after 78 days of operations, was NATO's unity and resolve. NATO acted in a way that was tough, progressively tougher throughout the campaign. It failed to be deflected from its goals. This lesson was very clear to President Milosevic, who had hoped he could outwait NATO. Secondly, both the precision and the persistence of the air campaign were fundamental factors in convincing President Milosevic that it was time to end the fight. The air campaign, which started slowly but gathered momentum as it went on, became systematically damaging to his entire military infrastructure, not just the forces in the field in Kosovo, but throughout the entire country. The pounding his forces took during the last week had to have a huge impact on his determination to continue the fight. It had a big impact on the morale of the forces. Desertions increased, and there were increasing reports of lack of food, lack of fuel, lack of equipment, lack of will, lack of morale, and increasing dismay with the leadership not only of the forces but of the country, and an increasing feeling that they just saw no way out. They realized, because of NATO's persistence, the situation was just going to get steadily worse. On 3 June 1999, President Slobodan Milosevic finally accepted peace terms presented by EU envoy President Martti Ahtisaari and Russian envoy Viktor Chernomyrdin. With the authorization of the United Nations on 10 June 1999, NATO forces deployed into Kosovo, transitioning from Operation Allied Force to Operation Joint Guardian. 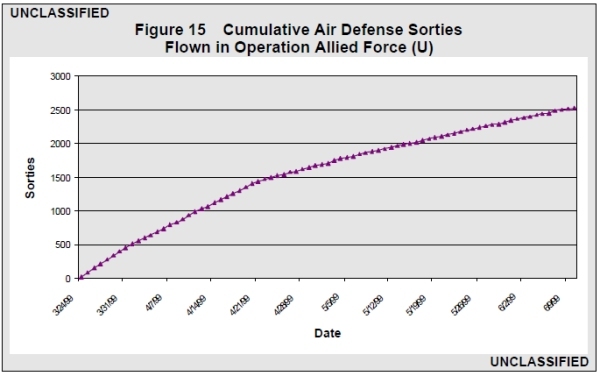 In January 2000, the US Department of Defense released an Operation Allied Force after action report to Congress. 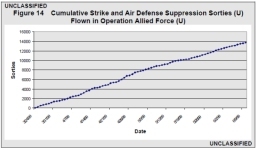 In it, the Department of Defense noted that notwithstanding the allied contributions, and overall success of the campaign, Operation Allied Force highlighted a number of disparities between US capabilities and those of its NATO allies, including precision strike, mobility, and command, control, and communications capabilities. The gaps in capability were real, and they had the effect of impeding US ability to operate at optimal effectiveness with its NATO allies. For example, because few NATO allies could employ precision munitions in sufficient numbers (or at all), the United States conducted the preponderance of the strike sorties during the early stages of the conflict. Problems regarding communication interoperability persisted throughout the campaign. Insufficient air mobility assets among NATO allies also slowed deployment of Kosovo Force ground forces — beyond those already in the theater — once Milosevic agreed to NATO's terms to end the conflict as part of Operation Joint Guardian. Disparities in capabilities were seen as having the potential to seriously affect NATO's ability to operate as an effective alliance over the long term. Similar issues remained present over a decade later during Operation Unified Protector with regards to Libya in 2011.